Looking S at W side of cottage wall. 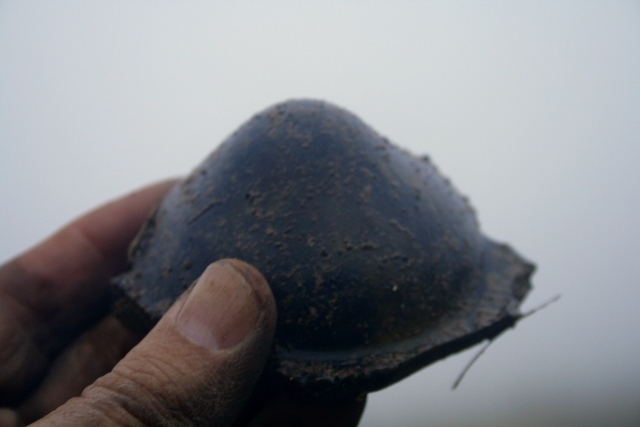 A grey damp misty day, but some very good archaeology made it all worthwhile, though the photo above may suggest otherwise! Looking N at SE end of cottage. 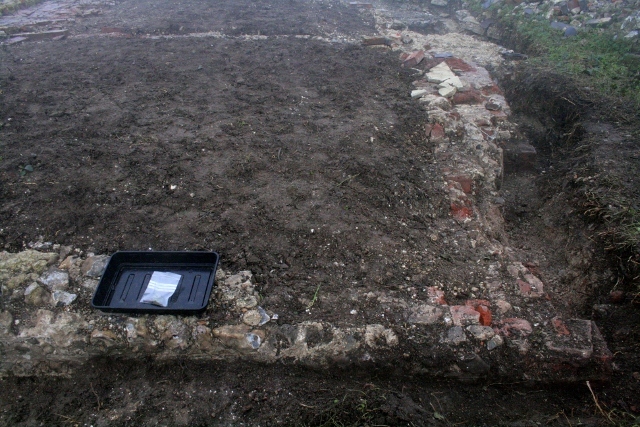 The complete outside face of the south wall of the cottage has now been excavated down to the original ground surface. The trench was just a shovel’s width, but apparently this is adequate for a laser scan of the site which is to happen sometime soon. A few finds, but nothing exciting, mostly window glass. On the west side of the cottage a good job is being done defining the outer face of its outer wall, cut flush with lower levels of the farmyard nextdoor by the 1950 bulldozer. This involved excavating compacted chalk rubble backfill overlying a mortar buttress at the base of the wall. 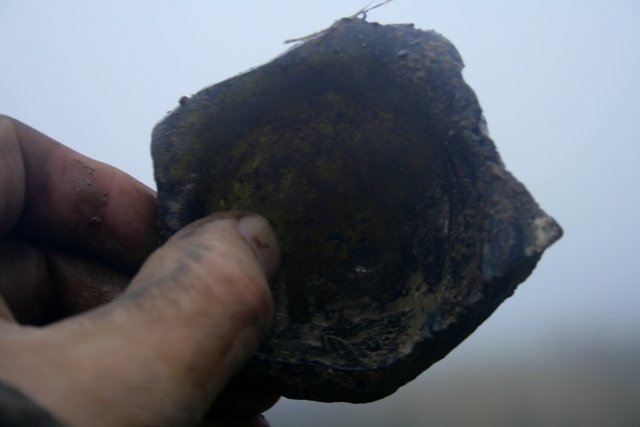 Some well stratified finds were excavated; a few pieces of bone and the base of a green glass bottle with a high push or kick-up. These should date from the time of the construction of the cottage in about 1830. 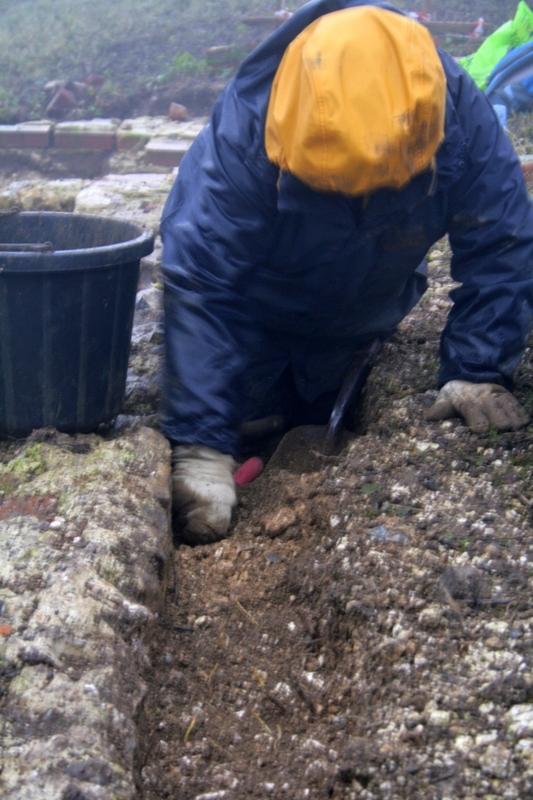 The north side of the garden boundary wall was also further excavated. Yet more flint cobbles were discovered on the pathway immediately in front of the front garden gateway. There were strong indications, based on wear and iron staining, of flints having been added on top of an older cobbled surface by way of repairs. Protected by an adjacent bank, it had accumulated an overlying fill of demolition rubble, which included a number of finds. 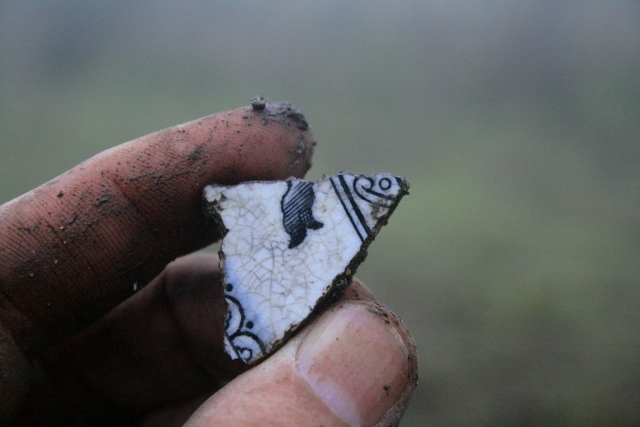 A range of very small decorated ceramic shards, bottle glass, and a .303 cartridge was found. 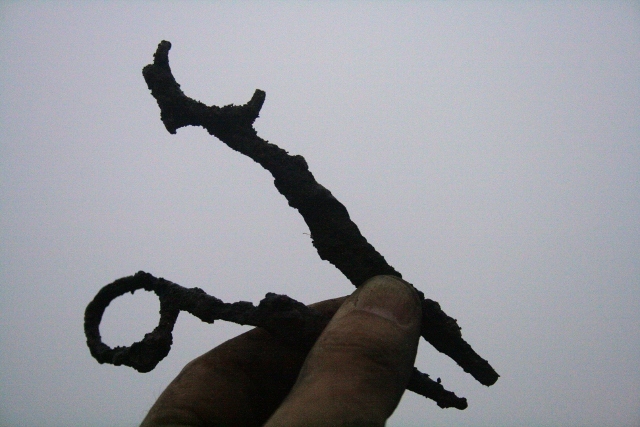 Best of all, amongst the rusty metal finds, two halves of a pair of scissors. 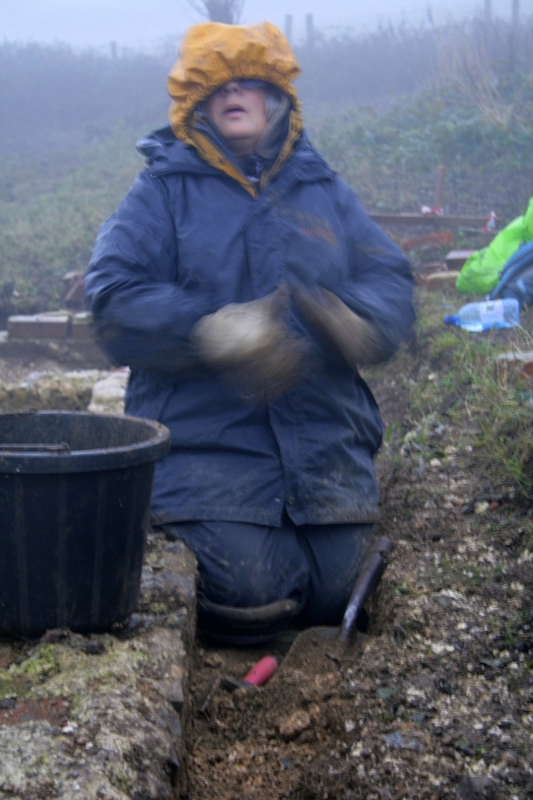 There is plenty more to do before we shut down for the winter, so we would love you to join us – either for a site visit, or to help us dig – no experience required! We meet at the car park near the junction of Bexhill Road and Falmer Road, just north of Woodingdean, Fridays & Sundays at 10am, and if the weather is too bad to dig we are still happy to give a quick tour for anyone interested. Please don’t hesitate to give me a call for further info.